The majority of the production cost incurred by Filipino farmers goes to labor, making it one of the crucial factors that retard their competitiveness. For 2013-2014, our average hired labor cost was at P3.76/kg of paddy rice. In the book, Competitiveness of Philippine Rice in Asia, this amount roughly covers 30% of the P12.41 average palay production cost/kg. So much work begs to be done to pull down the labor cost to a more competitive level. Among Asia’s six top riceproducing countries Vietnam, Thailand, India, Indonesia, and China, the Philippines would rank fifth in the lowest cost of hired labor. In overall production cost, fourth. Of course, these data don’t exist in a vacuum. Many factors have affected the local rice industry and other factors will not stop emerging, like the recent implementation of TRAIN Law. While there are early projections on the possible short- and long-term effects of TRAIN Law on the prices of petroleum products and other commodities, what is certain is that even before it was implemented, the necessity to reduce the cost of production in rice was already staring us in the eye. Luckily, some machines have already been developed to reduce labor cost during crop establishment and harvesting – the costliest operations in rice production (P4,196 and P5,967/ha in the 2013 wet season). Discourse on the fate of fuel prices is prominent today because of the higher specific tax on petroleum products. Hence, machines like the plastic drumseeder that do not consume fuel would attract farmers. Plastic drumseeder complements the direct seeding method. 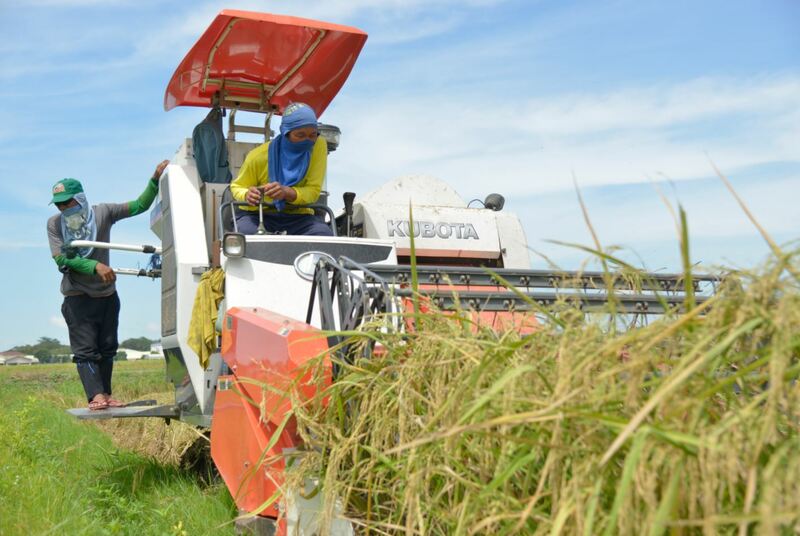 According to Dr. Arnold Juliano, head of PhilRice Rice Engineering and Mechanization Division, drumseeder rentals are not a priority among farmers, unlike other farming machines. It is usually bought by or given to farmer cooperatives. Juliano noted that using the plastic drumseeder is very convenient because it is portable at only 10kg. Equal spacing of plants can be achieved, hence it is superior to manual transplanting. “If a farmer decides to purchase a drumseeder, the cost can be recovered in just one cropping season, depending on the area to be seeded. However, drumseeder is not advisable for seed growers,” he clarified. The mechanical transplanter can also establish rice crops. While this machine consumes fuel, it drastically reduces labor requirement and cost, and mandays in manual transplanting. “Using the machine can help lessen transplanting shock in young rice seedlings, promote early seedling vigor, uniform crop stand, and enough density of seedlings per square meter. We can also expect less stress, drudgery, and health risks on the farmers’ end,” Juliano explained. Meanwhile, the multi-crop reduced-till planter (MCRTP) also reduces labor cost. With the machine, tillage in dryseeding operations can be reduced, thus fuel consumption is lessened. Also, it only requires one person to operate. PhilRice Engineer Kristine Pascual said using the machine to sow seeds in dry soil conditions and grow rice in aerobic setting significantly diminishes irrigation water use. Hence, fuel for irrigation can also be reduced. It can be used as well for different crops such as corn and mungbean. Still at its evaluation stage, the advantages of MCRTP can already be established. It will come very handy for farmers who practice multi-cropping. To economize on labor cost during harvest, choose among the combine harvester, mini-combine harvester which is currently being pilot tested, or reaper. They almost eliminate labor requirements of 10-15 people for manual harvesting to just 1-3 people for mechanized harvesting. Farmers can likewise net more yield because of lower losses than with manual harvesting. Each machine has its special features. The lightweight reaper and compact mini-combine harvester are ideal for small plots. To top it all, the three machines are ideal for standing rice crops.